Did you know that hummingbirds can actually be trained to eat out of your hand? 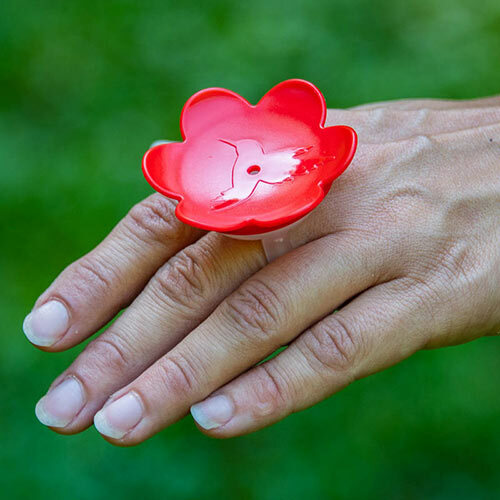 Or at least, to sip nectar from a ring on your finger. This kit includes everything you need to hand feed the neighborhood hummingbirds. You'll get two rings, the nectar mix, a container for mixing, pouring and storing nectar, a cleaning brush, and a syringe to fill the rings. It makes a fun activity to get kids interacting with their environment and the perfect gift for senior birdwatchers. 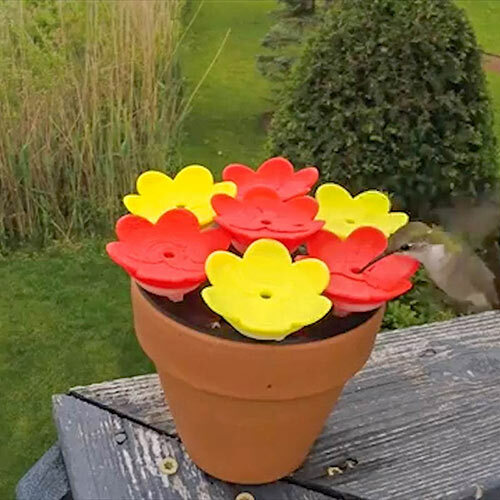 Simply put the nectar-filled ring in a flowerpot near where you often see hummingbirds. Let them get used to eating from it. After you see them going to it, put the ring on your finger. Stand still—you may have to wear sunglasses so as not to scare them. They'll have to get used to the ring on your finger too. Hummingbirds can be cautious creatures, but the rewards are worth your patience. It is absolutely fascinating to watch a hummingbird hover while they're eating—the iridescent wings beat and rotate so quickly that getting a hummer up close is the only way to properly see them. 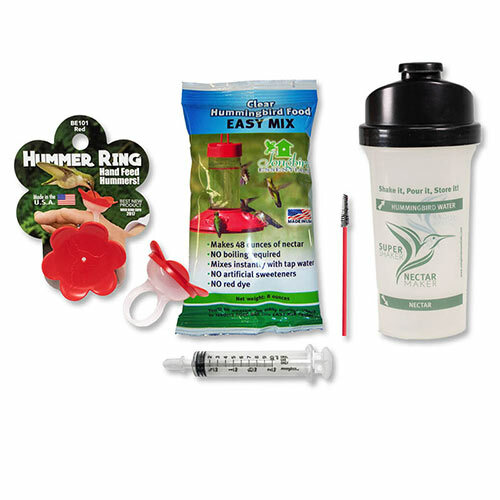 8 oz nectar pkg; 8" tall shaker holds 25 oz; syringe holds 2 tsp; brush is 4½" long with 1" tip. Adjustable rings fit most finger sizes. Shaker is dishwasher safe.